Ready to try the sport of paddle boarding? It has exploded in popularity! 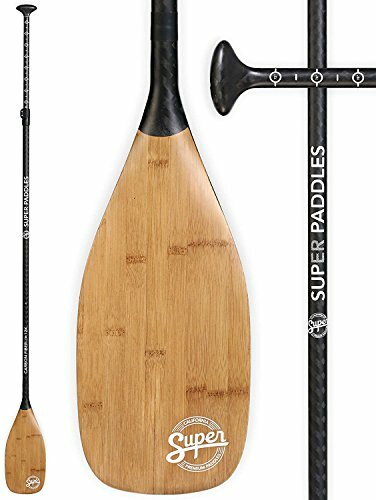 Now all you need is the best beginner SUP to get started. You’re in the right place, were going to help you choose the right board to get started with. We’ll break down what you need to know and we also have some top performers for you to choose from. We’re going to take a look at some inflatable SUPs and a few of the traditional solid paddle boards. After reading through our guide and reviews you should be able to make a good choice for a beginner SUP. Width: 32" 31" & 32" 30"
Here is a feature comparison of my top rated beginner SUPs with a comparison table and our buyers guide below will help you choose a SUP for you. Tower is probably the best known name in inflatable paddle boards and for good reason. The Adventurer is an excellent beginner paddle board because it very stable at 32 inches wide. It is made from Tower’s military grade PVC and drop stitch construction that gives it a incredible rigidity. Because the more rigid the paddle board the easier it is to paddle. The Adventurer has rounded nose which adds to stability but means its not going to be a fast board. At slightly under 10 feet its highly maneuverable, ideal for beginning boarders to learn on. With a weight capacity of 350 pounds it has the highest of any on our list. More than enough for another rider or bring your dog along! No reason to leave him behind. Even at a bargain price it comes with a lightweight fiberglass paddle that is suitable for all day paddling. The high volume pump inflates the board in less than 3 minutes. Time from car to water is less than 5 minutes! I like the fact they included a 3 fin design so the board tracks well, important for beginning paddlers. I would have liked to see Tower include a carry bag. Tower does make a specific backpack to transport the Adventurer. Video: See how to setup your Tower Paddle Board. While not as colorful or flashy as some of the other boards on our list, it has a classic look and with hundreds of 5 star reviews on Amazon, I’m not the only one who thinks this is an excellent board. Tower has one of the longest warranties on the market with a full 2 years warranty against manufactures defects. With Tower, you know they will be around to honor it. The Adventurer is one of the best SUPs for beginners at a reasonable price. Next on our list of best paddle boards for beginners is one by ISLE, one of the original manufacturers of paddle boards. This is a “traditional” solid epoxy SUP that is an ideal beginner board at 10 ½ feet long and 32 inches wide. Its highly maneuverable and stable, perfect for beginners! The EPS foam core makes for a very rigid board so its easy to paddle. Keep in mind with the solid type SUP you have to be more careful with it. They will scratch and chip, unlike an inflatable. Well discuss how to choose between them in our guide. 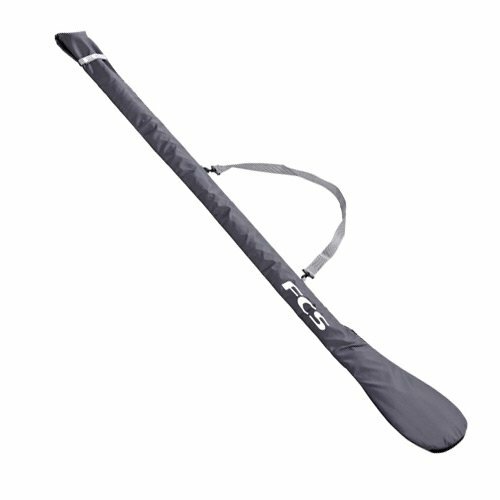 ISLE includes a nice carbon fiber shaft paddle that is lightweight and well made. There is one center fin for tracking and keep the board in a straight line. Being an solid epoxy board, it is slightly faster and easier to paddle than a comparable sized inflatable SUP. 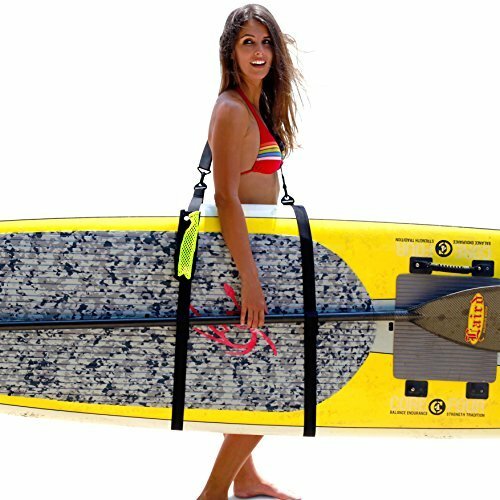 The board has a comfort grip handle in the center of the board so you can transport it easily to the water. 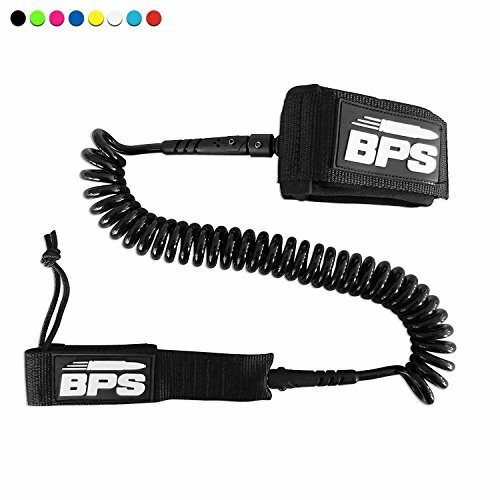 This is an excellent beginner board package, I would recommend you get a leash for it. The Versa is primarily designed for paddling on flat water to small waves and perfect for beginners. 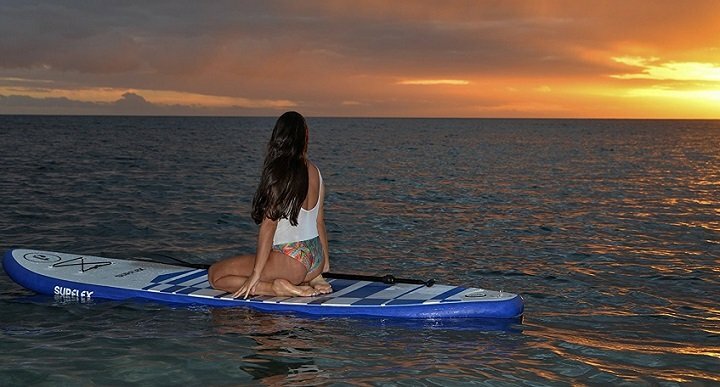 The Waterwalker is an inflatable SUP and probably the most beautiful beginner paddle board on our list. The Waterwalker has a simulated bamboo deck. Its not real bamboo of course but it really does look like it. Now that’s not why you want this board…. It’s a complete package, that includes the board, inflation pump, a paddle with a carbon fiber shaft, a carry backpack and a small deck bag. Everything you need is included to get out on the water, at a VERY reasonable price! 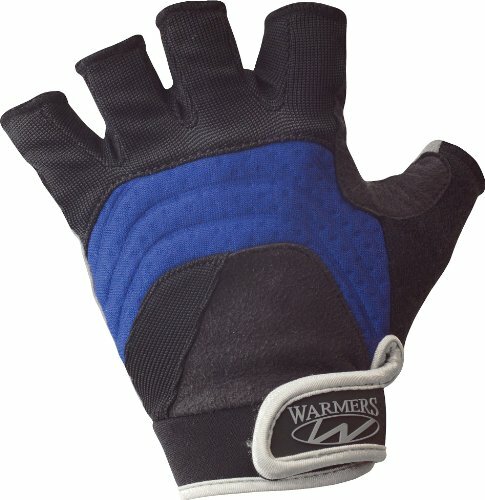 If features military grade PVC construction and drop stitch construction. The deck of the board has a soft, non slip EVA foam traction pad for all day comfort. The carbon fiber paddle is a nice upgrade from the standard aluminum paddles included with most paddle boards. Thurso even included a leash, this is a necessity in my opinion. If you fall off the board, the board can’t get away from you. With 3 fins, the board tracks well and 6” inches thick it is incredibly rigid when inflated to 10-15 PSI. But honestly when I inflate it, I only go to about 6-7 pounds or so. Its plenty rigid for me at that PSI, but that’s a personal preference. I really like the fact they included a quality backpack. If you need to transport the SUP any distance, you will really appreciate having one. Thurso Surf stands behind the board with a full 2 year warranty! If there are any manufacturers defects, they will happily replace the board. The Thurso Waterwalker is a VERY stable paddle board and in my opinion, the best paddle board for beginners! The BIC ACE-TEC is the most expensive beginner paddle board on our list. If you think you will be out on the water frequently you may want the spend the extra money for it. The ACE-TEC is a solid epoxy paddle board with a molded EPS foam core and a thermoformed plastic skin. The deck of the board is made a soft EVA foam for a slip free deck pad. BIC reinforced the rails of the SUP with fiberglass to help protect the board from dings and scratches. It’s a versatile SUP and designed to do just about everything well. From fishing to yoga to touring the ACE-TEC does it all! This board is designed to flow through the water effortlessly with a keeled nose. This cuts through the water better than the other boards on our list. It has a smaller rocker and a flat deck area for maximum usable area. The board is designed for flat water and small waves. Don’t try and surf with it. But if you want to fish, practice Yoga or just explore, this is your board. It has lots of attachment points to bring along a cooler, fishing gear or attach a camera. It comes in 3 sizes, from 10 feet to 12 feet so there is a size for everyone. It also comes in a variety of eye catching colors to suite your style. If you can afford to spend a little more this is the best beginner paddle board! The Ancheer iSUP is the cheapest beginner paddle board on our list. Even at a bargain price it comes with everything you need to get out on the water. 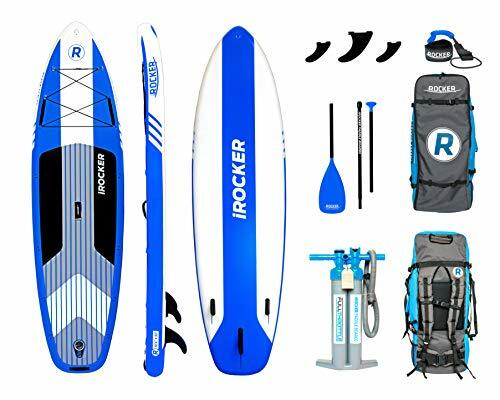 The package comes with a 10 foot long, 30” wide and 6” thick paddle board, an aluminum paddle, inflation pump with pressure gauge, backpack and repair kit. The board being 6” thick is incredibly rigid at the recommended 10-15 PSI but when I used it I only went to about 7 PSI and it was fine. I weigh 165 pounds so if you weigh more or going to be two of you on the board you may want to go to the recommended PSI. The deck of the board has has padded non-slip pad and comfortable for all day paddling. Even at a budget price it features 0.9mm military grade PVC drop stitch construction. 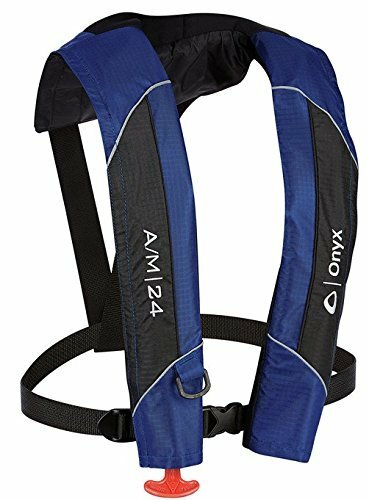 It comes with deck rigging for storing a cooler or other accessories like a life jacket and a stainless steel D-Ring in the rear to attach a leash. However, the paddle board doesn’t come with a leash. I would highly recommend to get one so the board doesn’t get away from you when you fall off. The included aluminum paddle is adjustable and works fine, if you will be paddling for long periods, I would upgrade to a lightweight carbon fiber paddle. It’s not as wide as the other boards on our list and is a bit less stable but nothing unreasonable. Video: First paddle with the Ancheer Inflatable Paddle Board. Overall this is a good beginner paddle board for the budget conscious paddler. The first decision you need to make is whether you want a traditional solid paddle board or an inflatable. Each have their advantages and disadvantages. While there are many types of paddle boards, we are only going to look at beginner iSUPs and solid paddle boards. Let’s take a look at each type to help you decide. Just like the name implies, you unroll the board and inflate it with a pump. Now just because it inflates with a pump, don’t get the impression they are soft and flexible. This type of paddle board has exploded in popularity in recent years and for good reason. They offer a number of advantages over a solid epoxy SUP. This type of paddle board has been around for quite some time. The materials have changed and they are now lighter and more rigid. Typically they are made from a epoxy/fiberglass combination. They still have a number of advantages and make good beginner paddle boards. Inflatable SUP vs. Solid SUP – Which is Better? Let’s compare a solid paddle board to an inflatable model. Portability – The defining characteristic of an iSUP is how portable they are. They can be deflated and stored in a backpack or duffelbag and fit in pretty much any car. However, you may want to consider using an electric inflation pump, inflating one is a bit of a workout. Inflatable SUPs can be inflated and ready to go in 2-3 minutes. Even less if you use an electric pump. You can go from car to the water in about 5 minutes. Traveling and want to take your SUP? iSUPS can be checked for the standard baggage fee (or fly Southwest and its free) and you won’t have to rent one. Durability – Modern “military grade” PVC is incredibly tough. They are almost impossible to puncture. Sticks, rocks or coral will not pop them. They also do not chip, crack, dent or scratch like a solid paddle board. Storage – iSUPS are not only easier to transport, they are easier to store. The ability to store one in a closet is a huge advantage. If you live in a small apt, this makes an iSUP almost a no-brainer! More Forgiving – Falling on a solid paddle board can be painful. The solid construction that makes them rigid and makes them more painful if you fall on one. While a iSUP is a little softer and will hurt less if you fall on it. Setup – No escaping this one. You need to inflate them, while it might take as few as 2-3 minutes if you go hard at it. You always need to bring pump along. Plus, you then need to deflate it and put it back in its carry bag. Speed – Being they are usually thicker and less rigid, they are slower than a comparable solid paddle board. Surfing – If you want to get into surfing, an inflatable paddle board by its design has a fatter more curved rail which makes it more difficult to carve turns. Setup – No inflation required. As soon as you take it off your vehicle your ready to go. Put it the water and your off! No deflation required either. If you are next to the water and don’t need to transport your SUP, you will probably be better off with a solid SUP. Speed – No way around it, a solid SUP is always going to be faster due to its extra rigidity. They make better touring SUPs and if your paddling around all day you are likely to get less fatigued. Surfing – Planning on surfing some waves? A solid SUP is always going to outperform a iSUP. They will be easier to turn and maneuver. Storage and Transport – Unless you live next to the water, your going to have to transport your paddle board. This will involve a rack of some sort. If go you with a solid SUP, here are my recommended paddle board roof racks. This will require you to lift and strap in on the car. While SUPs are not typically that heavy, if you have any back or shoulder problems this maybe be an issue. Durability – Being made from fiberglass/epoxy they can be scratched and dented fairly easily. You have to be more careful with them as compared to an iSUP. If you have started looking at SUPs you may have noticed that there are quite a few types, shapes, lengths and widths available. Don’t worry it’s not that complicated, we’ll break it down for you so you can better understand paddle boards and what to look for. Paddle Board Length – Which is Right For You? Paddle boards range in length from about 8 feet all the way to 15ft or more. < 9 Feet – These boards are easy to steer and maneuver. If you think you will try surfing with it, a shorter board is ideal. They are harder to keep in a straight line and are slower than a longer board. 9 to 12 Feet – This is the “typical” size paddle board. For a beginner paddler this is the length you should be considering. While not as fast as a touring board or as maneuverable as a shorter board, they do everything well! 12 Feet and longer – This length of board is meant for racing or “touring”. Maneuverability is not the key, its speed and tracking. These longer boards are faster but harder to steer. I would not recommend this type for your first paddle board. Somewhat more important with inflatable SUPs, they come in either 4” or 6” thicknesses. With the 6” variety much more common because they are usually much more rigid and have less flex than a 4”. The only downside of a 6” model is the higher center of gravity but this is offset by the extra rigidity they have. Solid core SUPs are normally between 4-5 inches thick. They don’t need to be as thick due to the construction materials used, a solid EPS foam core along with up to 3 stringers. Stringers are used to stiffen the board and reduce flex. The width of the board is the primary factor in how stable it is. Pretty simple! Narrow < 30” or less: A narrow paddle board will be faster because they cut through the water easier but give up stability. Not recommended for beginners. Wide > 31” or more: Wider paddle boards will be more stable and easier to keep your balance on, without feeling like you will tip over. Wider is better for beginners, simple as that! Rocker as the name implies is the shape of the front of the paddle board. The rocker is how angled up the nose is. It’s most important when you are paddling in rougher water or when you are surfing. A SUP with less rocker will tend to submerge or dive under the water in waves. Planing Hull: The most common type found in SUPs, especially beginner paddle boards. This type of hull is flat with a rounded type nose and tends to be very stable and less “tippy”. 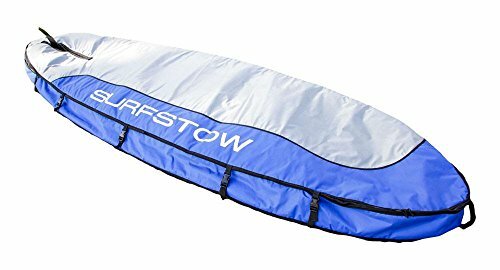 It’s a good option for a beginner in flat water to small waves. Displacement Hull: More commonly found on kayaks, this type of hull is more “V” shaped with a more pointed nose. This hull style is idea for a racing or touring SUP. Not ideal for beginner boards because they are not as stable. Fins aid in tracking or the ability to keep the paddle board in a straight line. As a rule of thumb the longer the fins, the easier it is to keep straight. The tradeoff is a longer fin makes it harder to turn. A single center fin: A common configuration is one larger fin in the center of the board. This is a good setup for flatwater paddling. Three Fin Setup: In this configuration three larger fins of about the same size provide excellent tracking and a good choice for flat water and carving good turns while surfing. Two + One Setup: This is a very common configuration for inflatable SUPS. It consists of a larger center fin and two smaller fins on each side. This is a good compromise for tracking and maneuverability. iSUP Fins: Inflatable paddleboards normally have either the single fin or the 2+1 fin configuration. They are different in that the larger center fin is easily removable and two smaller fins are flexible so the board can be rolled up. Paddle – Not an option, you need to have a paddle! Many beginner paddle boards come with an adjustable paddle. Typically they are not the best available. As you get more experienced you will probably want to upgrade to a lighter all carbon fiber paddle. They make paddling easier and less tiring over the course of the day. You can see my recommended paddles here. PFD/Life Jacket – You should always keep a PFD with you. It may be required by law, depending on what state you live in. If you don’t want to wear it, at least strap one down under some bungee cords. Best option? Wear an inflatable PFD that is light and doesn’t get in the way. Read my reviews of PFDs here. SUP Leash – This is definitely something you will want to have attached at all times. The leash will keep the board within a few feet of you. Roof Rack – Most likely only needed if you go with a solid SUP but if you are using an inflatable SUP everyday you may just want to leave it inflated and transport it on a roof rack. 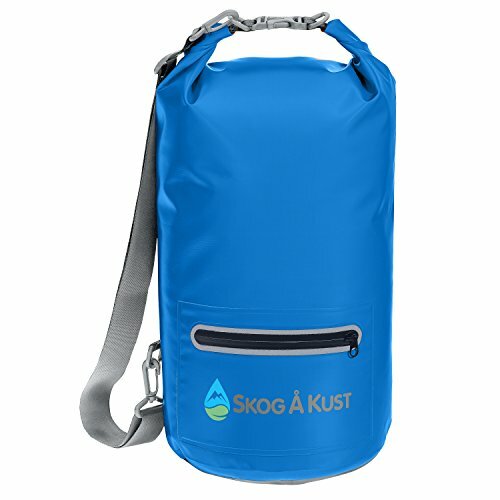 Backpack – Only necessary with an inflatable of course but if you have to hike any distance with your iSUP, a backpack will be invaluable! Electric Pump – Tired of inflating your iSUP with a pump? 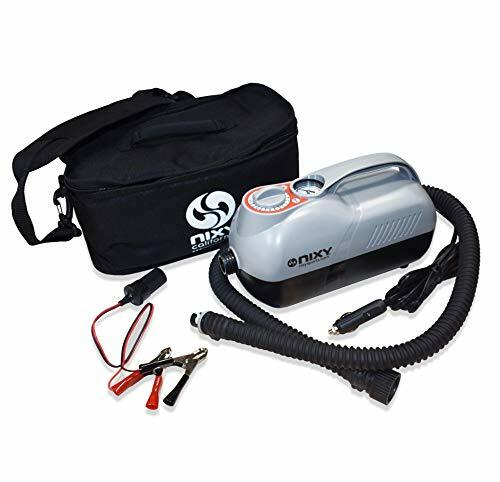 Get a electric pump, plug it into your accessory outlet in your car and let it do the work. Learn How To Fall – May as well get this out of the way, you’re going to fall off the SUP. Don’t worry all beginning paddlers fall off their boards into the water, you need to learn how to fall properly though so you don’t hurt yourself. The main thing to remember is try not fall forward and hit the board, lean back if possible and fall into the water and away from the SUP. It’s not a bad idea to practice it a few times to get over any fears you may have. Use a Leash – This goes along with tip 1. A leash will prevent the board from getting away from you when you fall off the board. This becomes especially important if you are in a current or rougher water where the board will drift away from you. It will also relieve any stress you have about losing your board. If you are not a strong swimmer you should never paddleboard without a leash. It’s also a good idea to wear a life jacket. Mind Your Space – This is especially important if you are in an area with other paddlers, kayakers or power boats. Try and keep as much distance as possible from other people so you don’t run into other people, there should be plenty of room for everyone. If there isn’t you may want to try a different spot! Don’t Rush It – Paddleboarding is a sport you can enjoy your whole life, don’t feel like you need to become an expert overnight! While not a difficult sport to master, it will take some time learning how to keep you balance, paddle, and steer the SUP. Take a lesson if possible to learn proper techniques. Beware the Wind – One thing you will quickly become aware of is how much the wind will impact your paddling. Your body is essentially acting as a sail and will push you, sometimes where you may not want to go. If you find the wind overpowering you, just sit down on the board reducing the effect the wind will have on you. Holding the Paddle – This may seem silly and obvious but be sure you are holding the paddle so the slope of the blade is away from you. It seems counter intuitive at first but as you pull the blade through the water you will quickly find it more efficient. Don’t just paddle with your arms, use your shoulders and core as well to pull the paddle through the water. Wear a PFD – When you are starting out paddle boarding you are going to fall on occasion, maybe a lot. You should wear a life jacket at all times to stay safe. Even more important if you are not a strong swimmer. Just because you have a leash doesn’t mean it can’t slip off. Longer boards will be faster and easier to paddle than a shorter board. If you think you will be paddle longer distances, you may want to spend a little extra and get a longer board. The downside to a longer board is that they are harder to steer, especially for beginners. The nose of a paddle board will also affect how fast you go. A rounded nose will in general be better in rougher water and more stable while a pointed tip will slice through the water and be easier to paddle and faster. Deciding on a inflatable or solid SUP. This is probably the biggest decision you will need to make. We cover the pros and cons of them. Carefully consider if the advantages of an iSUP like ease of transporting it are worth the trouble of inflating it. Either will work just fine for most paddlers. Consider your budget. Inflatable paddle boards can be had for a few hundred dollars that will perform just fine. Solid core SUPs usually start in the $500 range and go up from there. Why Should You Start Paddle Boarding? Lastly let’s consider why you may want to start paddle boarding in the first place. There is a reason paddle boarding has become so popular, its fun and easy to get started! It’s not only fun and relaxing it’s also a great sport to do with other people. Paddleboarding is an awesome way to get a workout without feeling like your “working out”. You won’t even realize it while you’re doing it but it’s an excellent full body workout. You will workout your legs and core by just standing on the board and keeping you balance. Paddling will workout your arms, shoulders and core with NO impact whatsoever. For this reason people of all ages can enjoy the sport, from the young to the very old and take advantage of the benefits of paddle boarding. Many people now practice Yoga while paddle boarding! This is an advanced level activity and requires a advanced level of balance to stay on the board while practicing your poses. As you get better paddle boarding you may want to try it. Most towns and cities have instruction classes. The social aspect of paddle boarding is one of the best reasons to try it. Go with a friend or family member and enjoy getting a workout but great together time. And it’s not just for humans, you can take your dog as well! No reason to leave your furry friend behind. There is plenty of room up front for most size dogs. Lastly there is an almost “zen” like quality to paddle boarding. It’s relaxing way to enjoy some time with mother nature. Enjoy the sport of paddle boarding! Q: Can I paddle while sitting on the SUP? A: Absolutely, in fact that’s how you should learn by kneeling on the board and getting comfortable before you try standing up. Q: Which SUP is better for me, a solid or inflatable? A: Well it really depends on your situation. Do you have room to store the board? Do you want to carry a SUP on the roof of your car? Do you live right next to the water. By answering these questions you should be able easily figure out which is better for you. Q: What is drop stitch construction? A: This is unique to iSUPS and is how they are able to be so rigid. It refers to the fibers that connect the upper and lower portion of the SUP to keep it rigid. Q: What size SUP should I get? A: Getting the proper size SUP is usually determined by your weight but there is are no hard and fast size rules because SUPs vary not only by length, but also width and thickness. You need to consult the manufacturers recommended weight capacity for the SUP. Q: Can more than one person ride a SUP? A: Absolutely, you are just limited by the size of the board and its weight capacity. Its a fun activity to do with a friend or family member. Don’t forget about your dog! Paddle boarding has exploded in popularity and as a result there are a lot of brands of paddle boards. Many are newcomers and unknowns. You are better off sticking with manufacturers that have been around and have good reputations that can honor their warranty should you have a problem. Tower – Probably the best known brand of inflatable paddle board. They have been around for over 5 years and have the backing of Mark Cuban so you can be assured they will be around! ISLE – Founded in San Diego by Marc Miller & Doug Pate, they specialize in only making quality surf and paddle boards. BIC – Yes this is the same company that makes the disposable lighters! They have a huge line up of water sports equipment. With the backing of a large company you can be assured they will be around! Ten Toes – Specializing in only paddle boards and skate boards. They make some of the best beginner SUPs on the market. Thurso Surf – All they make are inflatable paddle boards and bodyboards. They have an excellent line up of beginner to racing iSUPs. I hope this guide was helpful for finding the best beginner paddle board to fit your needs. If you want to comment or recommend a SUP I didn’t include, please use my contact form to get in touch. The Tower Paddle Boards Adventurer is our Editor's Choice for the best beginner paddle board with its combination of stability, ease of paddling and value.